Our Theme Party is back! Look forward as we take you back to old school days and bring back wonderful memories for you! Be prepared to rock and roll with other eligible bachelor and bachelorettes! As the saying goes, ‘Teaching is a work of heart’. 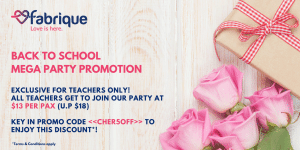 1st September is Teacher’s Day and we’re offering all teachers an exclusive discount to our Back to School Theme Party! Scroll down for more details! Event includes admission only, drinks at own expenses. Birthday Voucher & Event Pass are not accepted for this event. 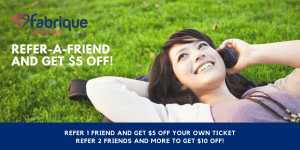 Simply key in promo code <CHER5OFF> when you sign up to enjoy the discount! Participant must be a teacher /educator to enjoy this discount. Participant is required to send in a copy of staff pass to events@fabriquelove.com for verification. Discount is only applicable for the Back to School Mega Party event only. Fabrique reserves the right to revoke this promotion at its own discretion.